This carrycot is compatible with all Jané chassis and pushchairs. (models include: Jané Trider, Rider, Crosswalk, Epic, Muum, Minnum). No Need to use or buy extra awkward fitting kits as it attaches usings Jane's built-in PRO-FIX system. It has just arrived to me. 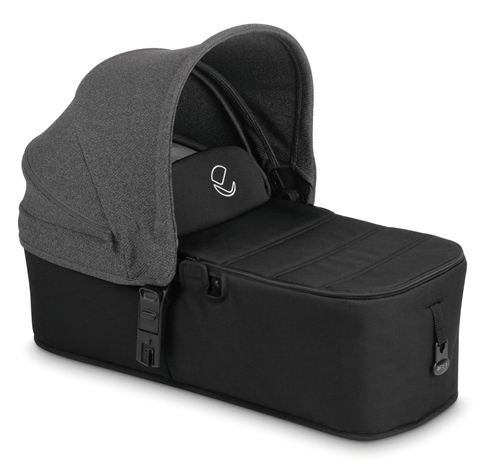 I like this carrycot for many reasons. First of all it has a light weight, secondly it has a wooden floor and fitted mattress thus the baby will have healthy bones. And carrycot has a normal (good) length 74 cm so it can be used through 6-7 months. Bought as addition to Jane Slalom pro Zero. Nice carrycot, bright color, wooden base. With chassis looks perfectly! Got a price match! Very solid, reliable product. Would have been nice if there wasn't a heavy wooden floor in it, to reduce the weight even further. But we use it as an alternative to our Matrix Light 2, which is a lot heavier. We needed a lightweight alternative to our normal Jane ca**eat and this was just what we were looking for. We don't have a lot of space at home for storage and since we only use this now and again the fact that it flattens into about 2 inches thick is great for just slotting into a cupboard out of sight! Would definitely recommend. Just a pity we cant use this in the car! A nice product but very wobbly on the Trider. It has straps to attach to the chassis of the Muum in addition to the pro-fix points but these don't fix to the Trider. I figured out a way of attaching it myself though. Also looks like it should be located a bit further forward, but the base of the Trider is quite long. I'm happy with it though (with my extra fixings added) and would buy it again. Haven't actually put a baby in it yet though!